Galaxy S5 Leaked? This Picture Makes Us Think So! So, we were browsing around in Google+ when the image below struck us. 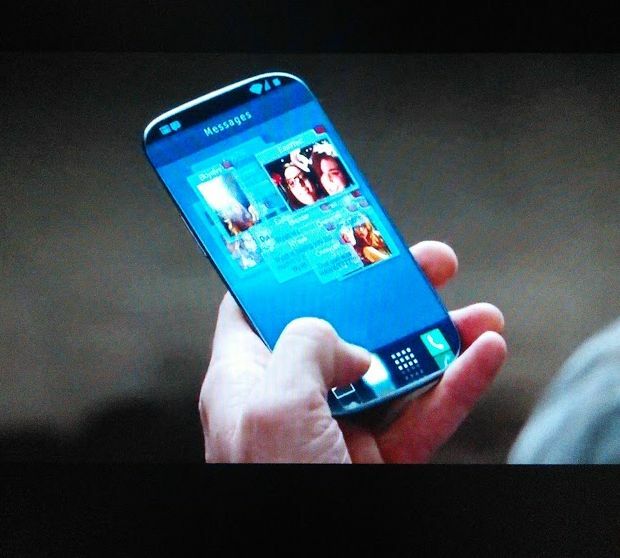 It looked just like the Galaxy S5 we would have imagined and it was posted by Raoul Thomas, who saw it on a movie called Paranoia. Now let’s see what other intel we have on the upcoming Galaxy S model. First of all, the OS here looks strange, since it’s sort of like Android, but also with a blue-ish hue that I’d associate to either TouchWiz or Tizen OS. There’s an edge to edge display here, said to support a 2K (2560 x 1440 pixel resolution) on a 5 or 5.2 inch diagonal. There should be a 64 bit CPU inside or a new Exynos Octa core CPU, as well as 3 GB of RAM and up to 128 GB of storage. At the back we expect a 16 megapixel camera with OIS (or not), while inside there should be a 3000 mAh battery. A metal casing may not be out of the picture and what’s strangest here is the fact that there’s no room for a Home button or front camera on the facade. So, is this the real Samsung Galaxy S5? What do you make of it?